A unique collaboration is taking place between researchers from UWM’s College of Health Sciences and Sangmyung University in Seoul, South Korea. 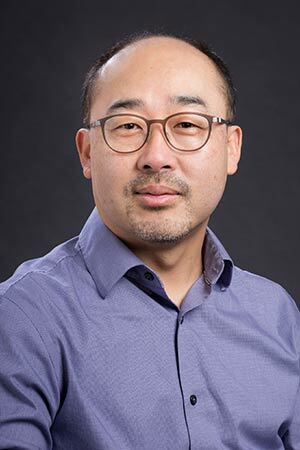 Associate Professor Jinsung Wang, PhD, from the Department of Kinesiology Exercise Science & Health Promotion Unit, and recent Visiting Professor to UWM, Suh-Jung Kang, PhD, are collaborating on a three-year research project to determine the potential benefits of a cognitive walking program on older adults. What is a cognitive walking program? Wang and Kang developed a walking-based exercise program, called a cognitive walking program, which is designed to improve cognitive and motor function of the brain in healthy, older adults. A group of 140 older male and female research participants, who have no apparent cognitive or motor impairments, but are physically sedentary, were recruited for the research. The individuals were divided into two groups: a normal walking program and the cognitive walking program. The people in the normal walking program meet regularly for a six-month period to go on a typical walk for 60 minutes per day, three days per week, as a group. On the other hand, those participants who are in the cognitive walking program are asked to first learn specific walking patterns that involve the movements of both the upper and lower limbs in certain ways and then perform them repeatedly based on the memory. There are 45 stepping patterns with a varying complexity of the arm and/or leg movements, and the individuals perform these movements on a mat made especially for this research project. Each session of the program (also 60 minutes per day, three days per week) starts with the simplest stepping pattern and then advances to more complex patterns. As the sessions pass, the tasks get more complex which forces the participants to think more to perform them correctly. The project is funded by a grant from the National Research Foundation of Korea, and the data is collected in Kang’s lab at Sangmyung University. Kang is primarily interested in how the participants’ cognitive function, assessed using neurocognitive function assessment tools, will change after participating in these walking programs. Wang is primarily interested in the changes in motor function of the brain, assessed by determining the pattern of interlimb transfer of motor learning, a research paradigm that he has been using in his research for the past 18 years. Both cognitive and motor functions of the brain are being assessed before the participants begin exercising, at the three-month mark, and again after they complete the six-month program. Wang predicts that after participating in the cognitive walking program, the pattern of inter-limb transfer, which were fundamentally different from that of young adults prior to the participation in the program, should change to be similar to the pattern of young adults. However, the older adults participating in the normal walking program will have little to no change in their transfer pattern. Wang also predicts improvements in cognitive function in the older adults who participated in the cognitive walking program, but not those in the normal walking program. If these changes in cognitive and/or motor function of the brain are indeed observed in the older adults who participated in the cognitive walking program, then other individuals could benefit from the findings. The results would mean that walking-based exercise programs, because they emphasize the stimulation of the brain by requiring participants to memorize and perform complex movement patterns, could help older adults to maintain cognitive and motor function of their brain. Such an exciting discovery would lead Wang and Kang to apply for another research grant to examine the impacts of the cognitive walking program on older adults with minor cognitive impairments. Such research would allow them to determine whether this exercise program may even be able to reverse the effect of aging on cognitive and motor function of the brain in older adults who suffer from aging-related memory problems.